There is always pressure with performing on stage. When you are performing something which has won Oscars along with a whole catalogue of other awards, no doubt that pressure is doubled. 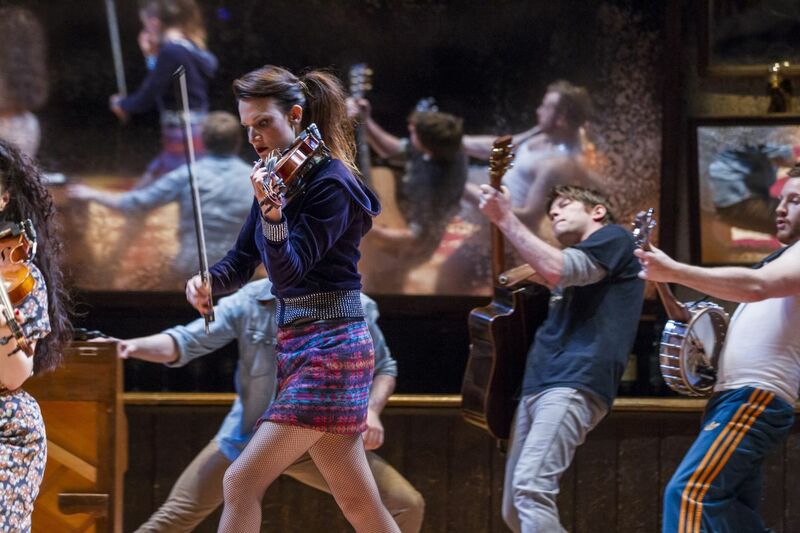 ROCKING OUT: Pictured (centre, holding guitar) is Sligo actor Bob Kelly who stars in the stage production of ‘Once’. Picture by Patrick Redmond. For Sligo’s very own Bob Kelly, the role of Eamon in the stage production of ‘Once’, made famous by the 2007 Oscar winning film starring Glen Hansard, he takes it in his stride. Speaking to the Sligo Weekender this week, the Knocknashee native, spoke of how he cut his teeth in the acting world. For the role in Once, Bob explains how he got the part. “The role of Eamon is not a very complex role. The story of Once is essentially about a boy and a girl and everyone else is in the background. With this piece, even though Eamon comes towards the end, you are on stage performing music all the time. The difficulty for me is not in the acting part of the show but in the music and getting that technically right and getting the musicianship up to scratch,” Bob commented. Although the switch between disciplines of music and then acting could be difficult for some, the blend and story telling of the music in “Once” is something which Eamon feels is not difficult. The play has done the rounds in London, Broadway, Korea and other parts of the globe. Bob was due to take up the role in the West End, however, other commitments meant he could not take the part until it came to Dublin’s Olympia this month. It will be busy in the months ahead for Bob. Following the last performance of “Once” in late August, his sights will turn to a short film which will appear on RTÉ. “As an actor you take what comes along so I am always on the go with different things. I have been branching out a little bit more into writing and I have made a short film for RTÉ which will hopefully make it onto screens in October or November. We have just wrapped on that in the last month. “I also do a lot of work with Blue Raincoat in Sligo as well. Following ‘Once’, I have a residency in the Hawk’s Well this year and we will be using that to get more projects that are connected to Sligo with Sligo history involved in a big way. There is a lot of writing coming up on my part,” Bob said. For the opening night of Once, although the film and other stage productions of the play have made it famous worldwide, Bob is not nervous about what lies ahead when it takes to the stage. For those who go along to the show early, as part of the set design there is a working bar which will also help to take some of the edge. “Once” opened on Tuesday, July 14 and will run until August 22. For details on booking and tickets see www.oncemusical.ie or www.ticketmaster.ie, or call the Olympia Theatre in Dublin on 01-6793323.